* This dough for this cookie recipe is formed by hand. You can also use a Kitchen Aid or other large mixer. Mix it all together with fork at first. Once it starts to form, you can use your clean hands. Flour a counter or big board. Remove dough from bowl, and knead for 8-10 minutes, sprinkling the surface more if the dough starts sticking. Grab a piece of dough, and begin to roll into a ball between the palms of your hands. You want it to be about the size of a chestnut. 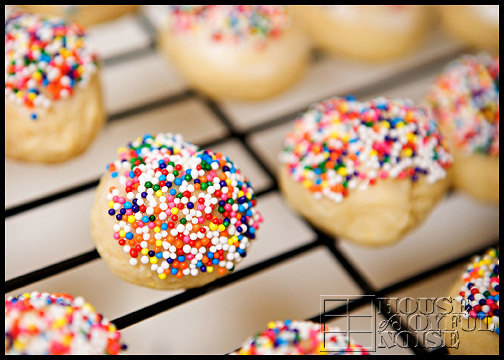 Place the dough balls on the cookie sheets, about an inch ½ apart, staggered. You will likely have more dough balls waiting for their turn in the oven. Bake full sheets for 8-10 minutes. You want them to be pale, but if you are wondering if they are cooked enough, open one with knife and see if it is baked through well. If not, put back in for 1-2 minutes more, depending on how doughy they still were. Remove from oven.........and then place them each on a cooling rack. In a small bowl, pour some confectioner's sugar, and add a little milk. I don't really measure the sugar or milk here. I recommend adding one tablespoon of milk at a time, and stir well. You want the glaze thick-ish. You will be surprised at how much powdered sugar you need! Pour sprinkles into shallow bowl. Watch out, because these things are ridiculously bouncy!!! Once the cookies are COMPLETELY COOLED, you can start glazing them. We just dunk the top of the cookie into the glaze, lift out, and really let it drip off as best as you can. Place dunked cookies back on rack. The glaze needs to set a little. Continue dunking cookies, but when keep checking the first ones you dunked, and once you see that the glaze on those is starting to become clear, they are ready for sprinkles! Now to get the sprinkles on the cookies, we think Mama's Godmother shakes them on out of the container. She has patience like that. But we dip them in a bowl of the sprinkles. Keep glazing and sprinkling, putting them on the rack as you go. Any air tight container is great storage for these. They are so pretty all together!